On 29 April, 2015, the pledging conference of the Chernobyl Shelter Fund was held in the London headquarters of the European Bank for Reconstruction and Development (EBRD). Government representatives from over 30 countries attended the conference. H.E. 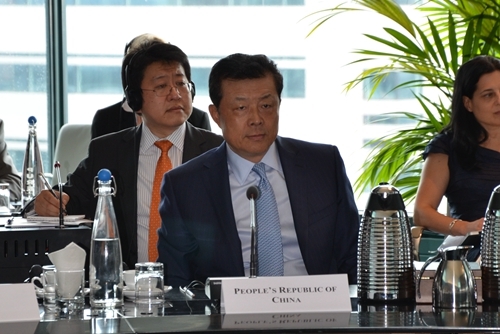 Liu Xiaoming, Chinese Ambassador to the UK, attended and spoke at the conference on behalf of the Chinese government. Ambassador Liu spoke highly of the Chernobyl Shelter Fund's positive role in addressing the impact of the nuclear disaster and EBRD's contribution to the smooth operation of the Fund. Ambassador Liu noted in his remarks, "Peaceful use of nuclear energy is rolling back the trend and providing a new way out in the efforts to safeguard energy security and to tackle climate change. Meanwhile, safety of nuclear energy remains a serious issue that should not be overlooked. The lingering impact of Chernobyl and the latest disaster of Fukushima are posing grave challenges to the development of nuclear energy. This challenge can only be met by joint response from the international community". Ambassador Liu emphasized, "China takes the safety of nuclear energy very seriously. Our principle has always been that the development of nuclear energy must be on the premise of safety and we have actively participated in relevant international cooperation on nuclear safety. The Chinese Government has vigorously supported and has taken an active part in handling the aftermath of the Chernobyl nuclear accident." "We are confident that with the joint efforts of the international community, the issues left over from the Chernobyl nuclear accident will have an appropriate solution". At the conference, Ambassador Liu met with Jochen Flasbarth, State Secretary of the Federal Ministry for the Environment of Germany and Suma Chakrabarti, President of EBRD for exchange of ideas on safety building issues of the Chernobyl ruins. A catastrophic accident occurred at the Chernobyl Nuclear Power Plant in Ukraine in 1986. Since the 1990s, the sarcophagus to seal off the ruins has shown potential hazards. In 1997, the G7 Summit decided to set up the Chernobyl Shelter Fund under the care of EBRD.